Get up and running with our Lineups as quick as possible! 1. Select "Create Free Lineup"
Well that's pretty easy! Now you can start selecting your team. And best of all, it's FREE, no credit card information, no PayPal. Just sign up! There's no I in Team! Let's add some of your mates, it's as simple as putting in their name and email address (if you want to send them invites to games). Also, make sure to upload some images of your team. By default, we use a blank headshot, but things start looking a lot better when you use a proper headshot, especially when in your team's kit. Select your team's name from the dashboard to enter the Team Management screen. From here you can choose any player and hit "Change Image". Upload your image, or even take an image there and then if using a mobile device. We recommend that you use a background that is a totally ddifferent colour from any clothes, skin or hair colour. Then draw round your player, mark the foreground, background and hit save! This is where it all gets interesting and starts to look awesome! Everyone has their favourite formation, so select this from the dropdown and the shirts will shift into your desired positions! Across the top you will see the list of players who have said that they can attend the match, with green ticks. If a player hasn't responded they'll have a question mark, but if you know they can play, you can still add them to the team. Now the easy bit! Just drag your chosen players onto the pitch. It really is that simple to pick a team and substitutes! Hit Submit and your lovely team sheet will be generated automatically. 4. Share With Your Team, Share With The World! 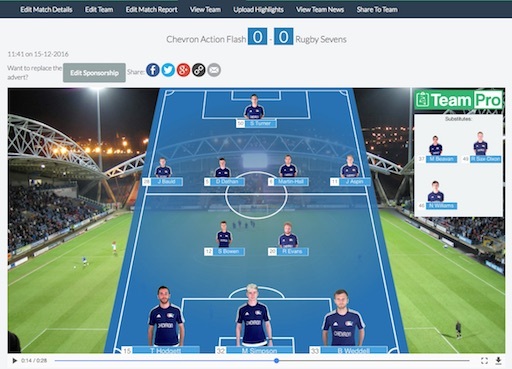 From the dashboard hit "View Team" and would you just look at that, a beautiful team sheet, with some very attractive players on there (yours, not ours)! Now you can choose to not tell anyone in your team about the teamsheet until the morning of the game. But we're guessing you're going to want to share this with them right away! 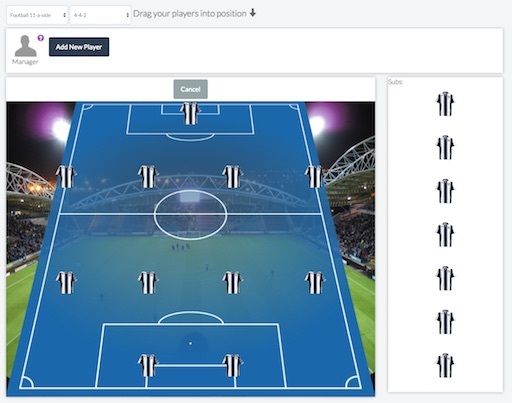 Just hit "Share to Team" and, after writing a message to your players, we'll send the team sheet to all your players, so that everyone will know just how awesome and clever you are! Also, if you're feeling really proud, you can choose to post the team sheet on your personal wall! Trust us, everyone's going to be pretty impressed and generally just assume that you've been signed by some amazing club to produce a team sheet like this! 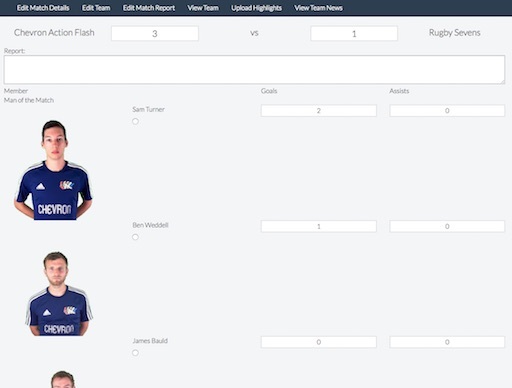 Not happy with your selection yet, don't worry, you can just hit "Edit Teamsheet" to go back to the team selection page and make some changes. Now it's a scientific fact that there is at least one person in every team that just loves player stats, and we do too! After your game, hit "Enter Match Report" from the dashboard and you'll be able to enter a whole load of information from the game including the score, scorers, assists, man of the match and also as much poetic reporting as you would like! Just fill in each of the boxes for goals, assists etc and tick the relevant box for the Man of the Match, hit submit and you're done. The updated match report can now be seen on the "View Team" page and can be shared with your team as with the team sheet above. We'll also keep a running total of everyone's stats in the "Manage Team" page, which you can get to by hitting your team's name on the dashboard. If you'd like to see more of the service in action, take a look at our Youtube Channel for lots more hints and tips.